Only on the web: Greenberg’s Naturalist’s Tour of Southern Lake Michigan. In A Natural History of the Chicago Region, Joel Greenberg takes readers on a journey that begins in 1673 with Father Jacques Marquette and Louis Joliet—the first Europeans known to have visited the Chicago region—and that we’re still on today. This is a fascinating story, told with humor and passion, of forests battling prairies for dominance; of grasslands plowed, wetlands drained, and species driven to extinction in the settlement of the Midwest; and of caring conservationists fighting to preserve and restore the native plants and animals. 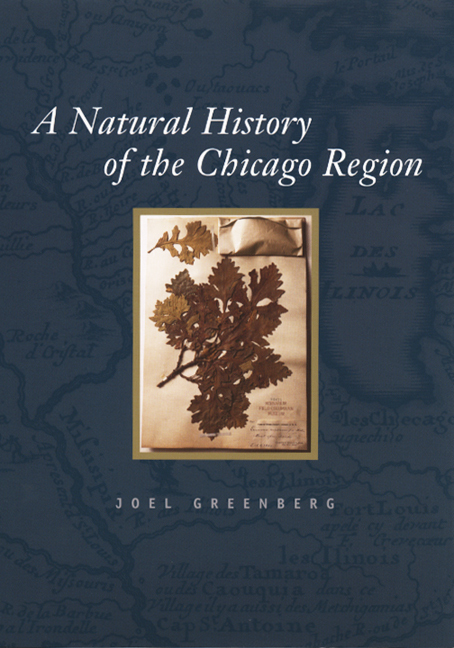 Intermingling historical anecdotes and episodes straight from the words of early settlers and naturalists with current scientific information, Greenberg places the natural history of the region in a human context, showing how it affects our everyday existence in even the most urbanized landscape of Chicago. "Joel Greenberg plays the role of scientist in A Natural History of the Chicago Region, exhaustively and objectively listing what was here. Sometimes with a heavy heart, and sometimes with humor, he explains who changed it, who destroyed it, who preserved it, and what we should do about it now. . . . It sticks with you when you look at the ground, or at the water in the lake (and in your glass), and at the plants and trees all around. When you go fishing, when you go hiking, when you go to work. Because you know what’s ’supposed’ to be wherever you look." "Joel Greenberg is something of a regional treasure himself, a man with a restless mind who can walk us out into the woods confident in his ability to share some great insight about why this or that patch of wilderness is important today."